A recent story in Tablet Magazine touched a nerve as we embark on a journey of discovery in Eastern Europe. Our interest in healthy eating goes beyond kombucha; it extends to other fermented foods and techniques that create probiotic-rich delicacies. The Tablet piece points out that the days of vendors in the Lower East Side hawking pickles from large wooden barrels may be in fade-out mode, fermentation is on the rise. The vast majority of those using this traditional method are doing so in their homes. In more recent years, the pace of new pickle companies seems to have slowed down, though people’s passion for fermented and other preserved products has not waned. It has merely shifted focus. “What I’m seeing now is the influence of Sandor Katz everywhere I go,” Jeff Yoskowitz, co-author of The Gefilte Manifesto said, speaking of the self-proclaimed “fermentation revivalist,” who has become the country’s patron saint of pickling. Which leads to our voyage of discovery. We, the co-founders of Kombucha Network, are headed to Poland and Germany on a three-week trip to unearth some hidden food treasures that speak to techniques handed down from generation to generation with perhaps a modern twist. We will be in Warsaw, an area an hour south of Gdasnk, in Gdansk proper and then on to Berlin. We will share, on our site, everything we learn and find along the way. Please stay tuned and be free to share your feedback. Arizona Hates Kombucha? Say It Isn’t So! Believe it or not, a person named Teresa Strasser–someone who makes lists for a living–has created a map that has each state’s least favorite food. For Arizona, she chose kombucha which, by the way, is not a food. And, by the way, Florida hates licorice, also begs credibility. Rain did not dampen the enthusiasm at the fourth annual Austin Fermentation Festival. Kombucha was front and center in our minds, and we were not disappointed with five vendors on hand. Much to our delight, as more people learn about the health benefits and tastes of fermented foods, the range of food, beverage, and related products at this yearly event has expanded, essentially outgrowing its quaint, earthy location at the Barr Mansion. Newcome Casper Fermentation shared their kombucha, made with raw black tea purchased from a Nannuo Mountain farm in Yunnan, China. 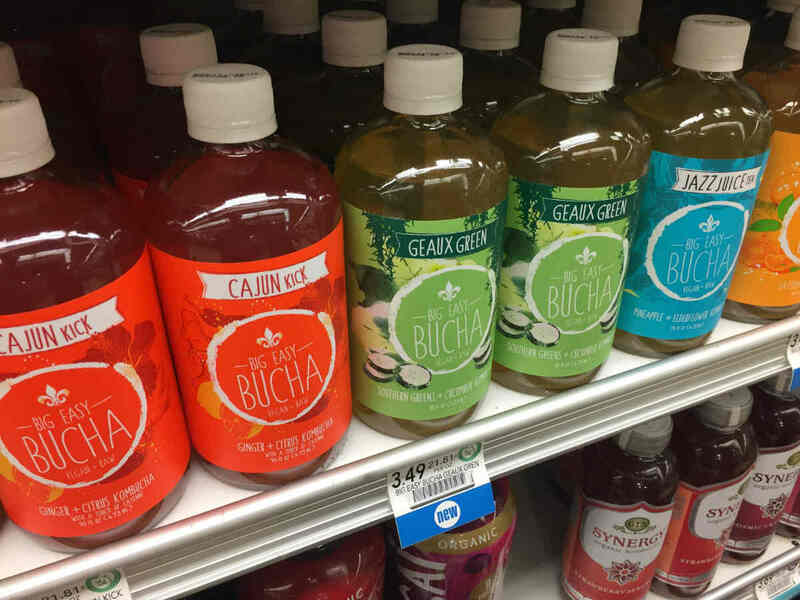 They are the only buyers of this tea in the U.S., and their kombucha is a light, tea-flavored product. Owner Benjamin Hollander stated that sugar is added only for the fermentation time, but it is “dry” for the bottling. 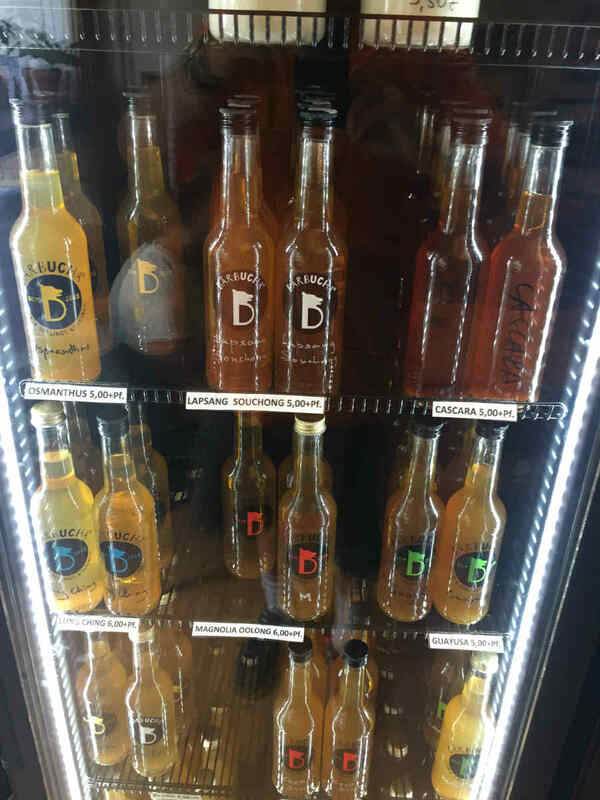 This small company also offered raw apple cider vinegar and dill pickles, available at a few select Austin locations. 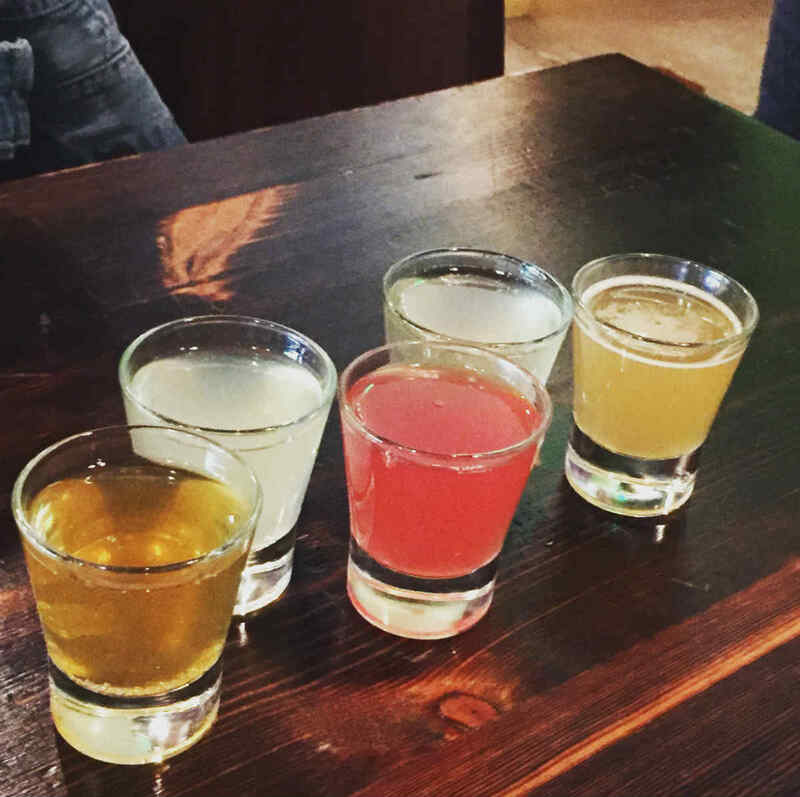 Three home-town kombucha brewers shared their goods. KTonic launched their fifth flavor on tap at the event. It is Cherry Blossom– thirst-quenching, fruity with spice flavors with hints of cherries, cardamom, and pepper. The new flavor will be available in stores on Jan. 1, 2018. Buddha’s Brew offering tasted of all their flavors, including basil, honey, and ginger. The company founders generously put on a workshop on “how to” brew kombucha and shared scobies with some of the participants. Wunder-Pils, most often found at the farmer’s markets locally, tasted their products and shared a prickly pear kombucha that was refreshing. New for them is a canned herb and tea beverage with the properties of a natural energy drink. Chipotle hot sauce made with kombucha was delicious– pleasantly hot with a perfect texture. The use of kombucha in new products is certainly a growing trend, as in the Wunder-Pils popsicles. Los Angeles based Health-Aide Kombucha was also on hand offering tastes of their original flavor profiles. Pomegranate was particularly interesting–tart and lightly fizzy. In the beverage area, Texas Keeper Cider has been expanding its offerings. A workshop on making cider was lively for those that were part of the hands-on tasting, while the remainder of the attendees heard the history of orchard-based cider brewing back to the Middle Ages. With heirloom apple popularity on the rise, this is certain to continue to expand as a popular fermented beverage. Boggy Creek Farm is one of the original urban farms in Austin, and Larry Butler, the co-owner, offered a workshop on pickling/fermenting vegetables, entertaining the crowd with his trial and error experiences in creating products from their farm’s own produce. His smoked tomatoes, pickled squash, and zucchini have long been in demand at their popular on-site farm market. Austinite Kate Payne, the author of The Hip Girl series, shared some tips on successfully fermenting sauerkraut. Kirsten Shockey gave a hands-on demonstration of making fermented hot sauce and spicy pepper mash. Other workshops ranged from fermenting vinegar, making chocolate, kimchi techniques and butter/cheese making. Sourdough is becoming more visible in fermentation discussions, given the bread and water (and sometimes yeast) are fermented to create the sour taste and smell. A chef from L.A.’s Manuela led a workshop on making whole wheat sourdough. The concept of bread as an additive to beer brewing is catching on, as grains, yeast, and water form the basic beer brewing mix. With discussion of food waste, it has become evident that one-third of the bread made in the U.S. is wasted so some beer brewers are using it as part of their beer starters. Other vendors in the fermentation tent offered dehydrated and freeze-dried fruits and vegetables, sourdough baked goods, vinegars and oils and Barton Springs Mill sold single grain flours, milled from Texas wheat varieties. Sandor Katz, a “fermentation revivalist”, was once again the inspirational, trendsetting event keynote. 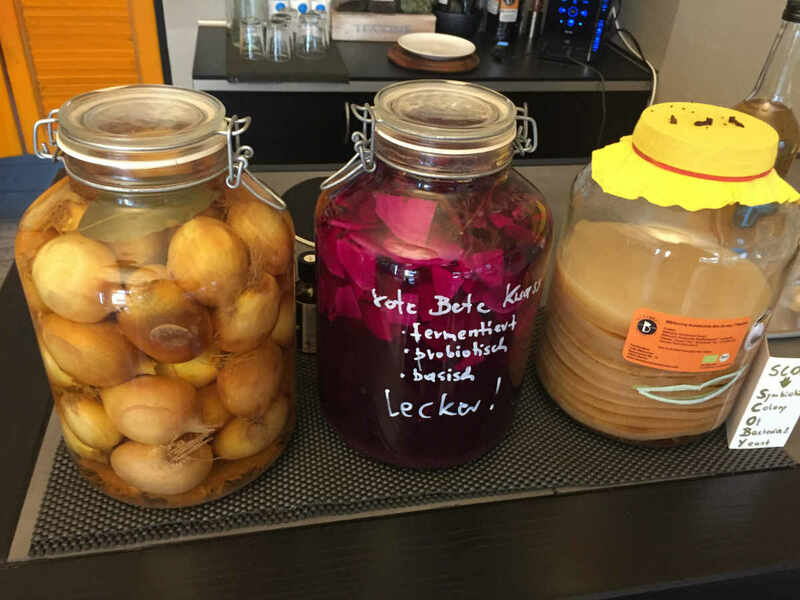 He tells his stories about fermentation, its benefits and the reemergence of the interest in “high quality living fermented foods and beverages. The evidence of small, cottage, family businesses making fermented products definitely was visible at the festival, reviving interest in fermentation arts, reinforcing Katz’s message. Inside the Barr Mansion at the event, films, and music (of course, this is Austin) provided a lively backdrop to the day. “Fermented” a new, heralded documentary by food lover and storyteller Edward Lee was shown as part of the festival. This is a must-see movie detailing fermentation techniques in various parts of the world. It launched at the Seattle International Film Festival and is being gradually shared with the foodie world. Probiotics remain on everyone’s list.